Walter Poole, complaining about recent writing habits, asked if it's possible to automate capitalization in Microsoft Word. so, walter, you don't like uncapitalized prose? it never seemed to bother e e cummings. 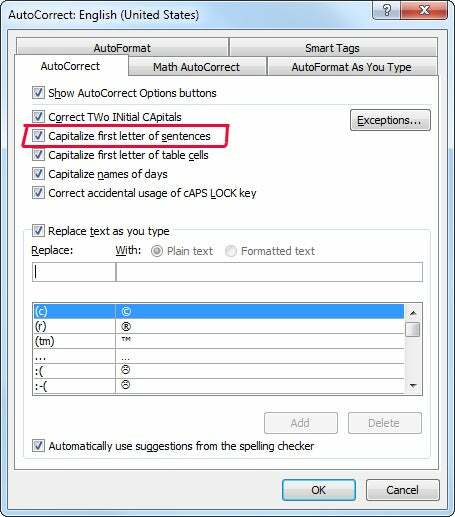 Microsoft Word has an option to automatically capitalize the first letter in a sentence. You'll find it in the AutoCorrect dialog box. 2003: Select Tools, then Autocorrect Options. You may need to hold the mouse pointer over the Tools heading for a second or two for the menu to expand and display that option. 2007: Click the Office orb in the upper-left corner, then the Word Options button. Click Proofing in the left pane, then the AutoCorrect Options button. 2010: Click the File tab in the upper-left corner, then Options in the left pane. Click Proofing (also in the left pane), then the AutoCorrect Options button. But not everything is written in Word. Far more sentences these days are written in email programs and phone texting apps. Texting especially encourages this sort of thing, because uppercase is more difficult to type on a phone than on a full keyboard. But I noticed no-cap typing in forums and emails long before texting became common. Like Walter, I find that it makes the writing harder to read, although other things annoy me more like run-on sentences that go on and on with many digressions without stop or without even the courtesy of an occasional comma. Language constantly changes--that's the nature of the beast. Some of those changes are bound to annoy people--including me.